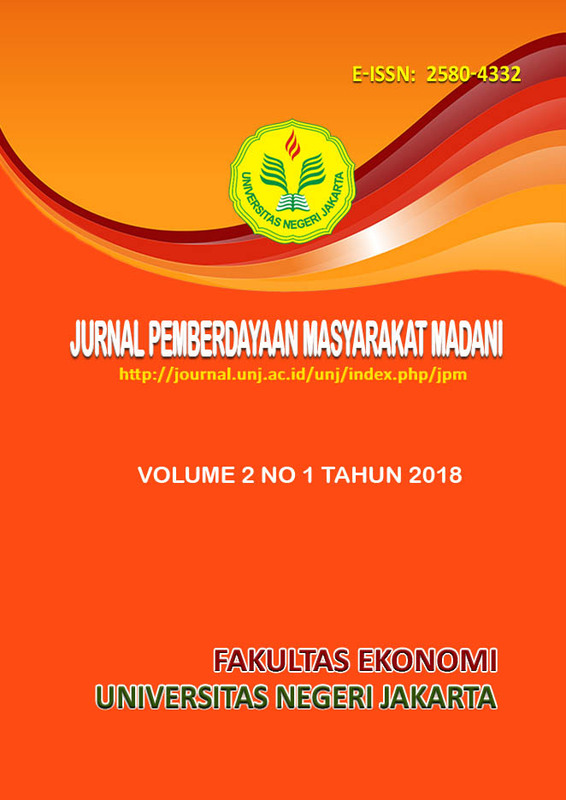 Jurnal Pemberdayaan Masyarakat Madani (JPMM) E-ISSN: 2580-4332 is published by Faculty of Economics, Universitas Negeri Jakarta, Kampus A, Jl. Rawamangun Muka, Jakarta Timur 13220, Telepon (021) 4721227, Fax (021) 4706285 Indonesia. It contains articles report related to the application of science communication technology, education, entrepreneurship, business, culture and arts in empowering the community. Jurnal Pemberdayaan Masyarakat Madani (JPMM) is issued two times annually, i.e. July and December. The number of articles is 20 articles per year. Every article that is sent to the Editor, will be reviewed and scrutinized by the editorial board for eligibility or publication without diminishing the substance of the article. Hopefully this paper can provide valuable contribution to the development of economic and business education in Indonesia and also internationally.